Name of the Year dates to the fall of 1982 and names taped to a dorm-room door on an Ivy campus: Dexter Manley, Cornelius Boza-Edwards, Baskerville Holmes. The following spring, Hector (Macho) Camacho was elected the first Name of the Year. What can we say? The first basketball baskets didn't have holes in the bottom. The first baseball players didn't wear gloves. Men of science believed the earth to be flat. As our onomastic senses were activated, our tastes became more refined. Some birds of prey can spot a rabbit a mile away. We could spot a great name two newspaper columns away. (NOTY predates the internet.) By the 1990s, the annual vote was a tradition unlike any other: About a dozen of us gathered to watch an NCAA regional semifinal. We played a drinking game called Pick-a-Player. (Pick-a-Player tip: Don't pick Steve Alford. Or Rumeal Robinson.) We voted. For Excellent Raymond and Crescent Dragonwagon. For Scientific Mapp and Courage Shabalala. In 1998, we turned our growing-by-the-year list of nominees (the World Wide Web! electronic mail!) 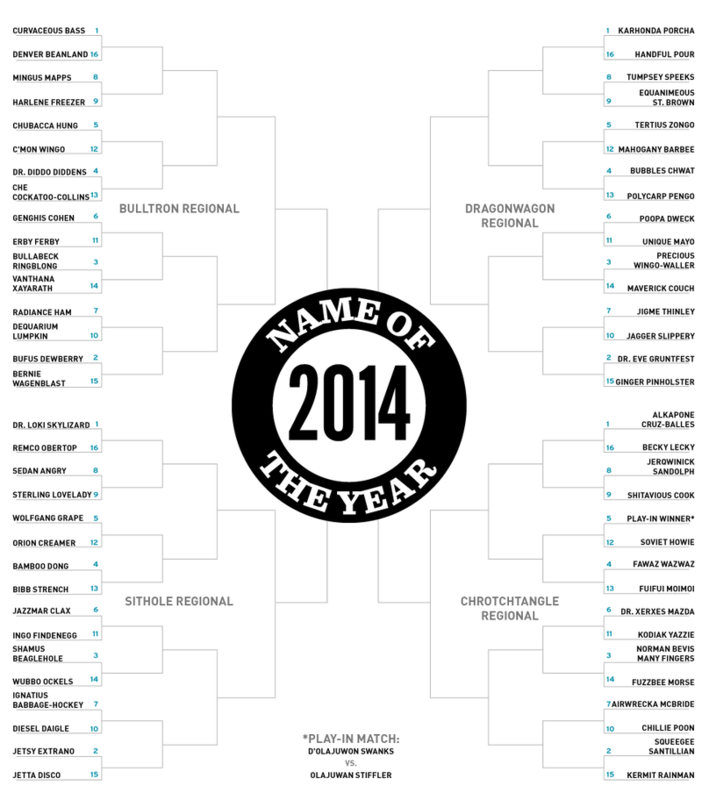 into a 64-name bracket. Actually, the study of names (onomastics) and human names (anthroponomastics) was here long before we were. According to this history, "the roots of the scholarly treatment of names" dates to ancient Greece. In Plato's dialogue Cratylus, Socrates tackles the nature and meaning of names. Explanations of the names of places and people are found in the Bible. In the 16th century, names were collected in dictionaries. By the 19th century, scholars around the world were analyzing names. The Online Etymology Dictionary dates the word "onomastics," defined as "the scientific study of names and naming," to 1936. The American Name Society was founded in 1951. What does that have to do with whether Tanqueray Beavers was a "better" name than Bunnatine Greenhouse in 2005? Or how on earth Monsterville Horton IV was an 11 seed—and had to face eventual champion Taco B.M. Monster in a regional semifinal—in 2011? Well, everything. "Names are interesting for what they tell us about ourselves and about the people who share or have shared the world with us," says Carole Hough, a professor of onomastics at the University of Glasgow. "Do we prefer plainness or elegance? Are we traditionalists, sticking to well established names, or innovators, looking for something unusual?" Innovators, Prof. Hough, unusual. In its three decades of existence, Name of the Year has been grounded in the beauty, irony, symmetry, creativity, contrast, contradiction, and, sure, humor found in names. Last year, when midlife intervened and we failed to get a ballot together, NOTY-obsessed grad student Tom Schroeder and blogger Sam Gutelle staged their own tournament. (The 2013 Name of the Year: Leo Moses Spornstarr.) We invited them aboard, together reviewed more than 400 name-inees (that was fun), and settled on a field of 65. Socrates approves. "That is a tremendous class of names which you are disinterring," he said. Deadspin will manage the voting. Tom and Sam will write the previews, which will be cross-posted at Name of the Year, where you can also peruse the NOTY archives and submit nominations for 2015. And please follow us @NOTYTourney. First-round voting will commence next week. But let's kick things off now with a play-in game that tips a Cappie Pondexter to an NCAA tournament legend and the very first year of NOTY: former Oregon high-school wrestler Olajuwan Stiffler v. current Seattle high-school guard D'Olajuwon Swanks. As always, may the best name win.